Feels very generic, like other, better movies that came before it. 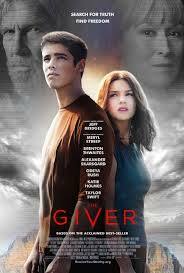 The Giver is a movie that resembles many other films which we’ve seen before. For one thing, the movie only got made because of the young adult craze of teenagers-in-movies rebelling against dark futuristic societies. This all got brought on by The Hunger Games, and was followed by a ton of film franchise (Insurgent, The Maze Runner,) now it has spread to The Giver, based on a classic book. The characters here in the movie have been bumped up in age, from children to young adults, just to go after that specific audience. The main problem is that this story about a society that has outlawed feeling and emotion (as well as color apparently), is too much like every other big brother dystopian film. from Fahrenheit 451 to Equilibrium, to Pleasantville to The Hunger Games itself, this story is old news by now and the movie offers us nothing new or creative at all. The problem with The Giver, a movie based on the great Lois Lowry book, is that it ends up being exactly like every other film out there. This movie combines the futuristic dystopian society of repressed individuals, with the young person trying to find himself in a world that dictates the way each person needs to be. If the movie had been made five to ten years ago, it might have worked. At least better than it does now. Today, however, every other movie has this same plot, from The Hunger Games to Divergent to The Maze Runner. The irony is that it is because of those movies and the success that they have been experiencing, that this movie was even able to get made. Apparently Jeff Bridges has been trying to get this movie made for nearly two decades now. It was his father, Lloyd Bridges, who was originally supposed to play The Giver. Evidently it took a surge in young adult books turned movies to finally get this thing off the ground. The problem is, The Giver is not a young adult book. It’s a children’s book. The hero is not sixteen or however old he is here, but less than ten. he’s just a boy. This movie makes him much older in order to make this movie look exactly like everything else out there these days. When compared to the other futuristic movies about a society that is basically a bunch of human zombies, unable to experience feelings or creativity, this movie doesn’t hold up very well. It uses black and white to show us that they can’t even experience color. Really? Like colors are going to make any difference in people’s lives and make good kids turn bad? That’s what the higher ups here are afraid of. Crime and rebellion. Murder doesn’t even exist anymore. Then again, neither does freedom. This very same storyline has been kicking around for ages, ever since Fahrenheit 451. There were some pretty good takes on it about a decade ago with V For Vendetta and Equilibrium, two movies that used the sub-genre as a means for catapulting into action movie territory. The Giver doesn’t go that route. Instead, it wants to be young-adult, teen-romance fare. More of s heart-throb film than an action picture. Bad decision. At the start of the movie, we meet Jonas and his two friends, a boy and a girl. We are told that the boy is the class clown and can make anyone laugh at the drop of a hat, only we never really see that. And the girl is the love interest. Jeff Bridges and Merrill Streep are in the movie too, but they’re kicked to the side in order to make room for the young people. Jonas lives at home with his parents, who are just as annoying as everyone else in this film. There’s a hint that his father, (played by True Blood’s Alexander Skarsgard,) has a little bit of personality and questioning of the system, but his mother, (played by Katie Holmes,) is given nothing more to say than “use the proper words,” over and over again. Merrill Streep plays the woman in charge of the society, and she is given the smallest role of all. It figures. The best actor this movie managed to tap and they limit her role to a handful of scenes. Bridges, portraying the Giver himself, is the selling point with some draw to it for why this movie might have had potential. He is a fantastic actor who has really gone out of his way in recent years. From The Big Lebowski to his villainous role in Iron Man, to his playing the John Wayne character in the remake of True Grit, Bridges has gotten more reliable than most. Still, there is nothing he can do for this role. The story is about these teenagers being given future jobs in their society and Jonas being given the job of the receiver. He will become the new Giver and right now he needs to go and receive information from the d one (Bridges.) All memories of what life was like before this society formed have been wiped out, and the Giver is the only one who now holds onto them. He’s like the advisor to the people, and he alone contains the information so that if they are ever facing a familiar problem again, he will know how to solve it. Now these ideas are actually original (not counting The Never Ending Story part 2.) They are about the only original thing in the movie. Once Jonas starts experiencing the memories of The Giver, he turns very negative about his current society. Especially when he sees what they do to babies who aren’t very strong. “They haven’t gotten rid of murder,” he says, “they just found a way to call it by another name.” It’s at around this point that color starts coming into the picture. It’s the Pleasantville effect, making everything look like it is brilliantly lit up. Only way too long of this movie is done in black and white. I would say about half of the movie. Using black and white at the beginning, like Oz the Great and Powerful or Space Cowboys, is a much smarter move. This way you are using it for effect without taking away from a solid half of the movie. The Giver is a lousy retelling of a story that we’ve seen again and again. There are a few original ideas here, like the naming ceremony where kids learn what their jobs will be for the rest of their lives, but mostly it’s the same old thing being given a fresh coat of paint to make it look different, (a very black and white coat of paint.) This could have been more interesting if we got to see the other friends in their jobs too, and not just Jonas. Something like the way Starship Troopers handled it, giving us storylines for multiple characters to follow. I anticipated some kind of action when the story finally heated up, but even that was extremely limited, if even in there at all. The biggest problem about this movie is how similar it is to everything else. It needed an original spin and it just didn’t get that here.